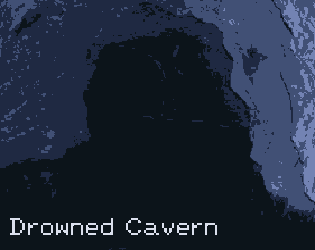 Drowned Cavern is a cross between a Choose Your Own Adventure story and a traditional piece of interactive fiction. It was created it as an experiment in narrative design, restricting the player's options to pre-set menus but preserving enough interactivity to deepen player involvement. It strikes a balance between choice and predetermined events, giving the player just enough sway to change certain events but preserving the story as it was written.